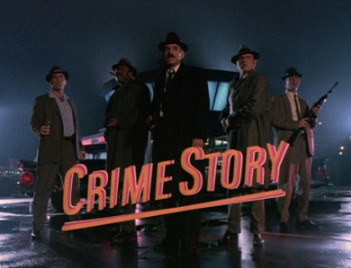 The Crime Story episode which served as the Season Two opener, starred, the late great former Chicago detective Dennis Farina. It was the first major television role for Kevin Spacey playing a Bobby Kennedy-like figure who flies to Las Vegas to hold racketeering hearings. 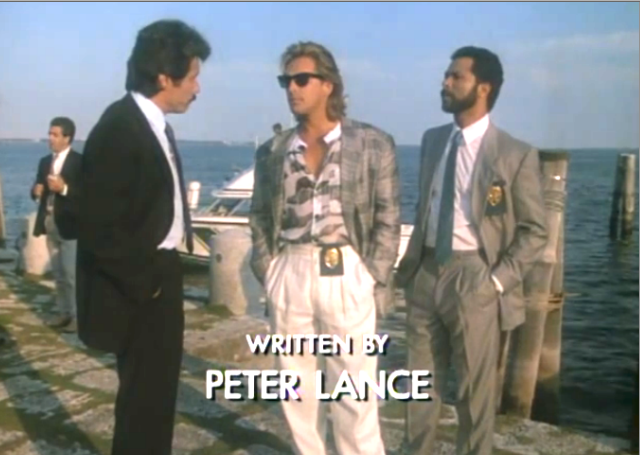 The Miami Vice segment,”Baseballs of Death,” was based on an investigation I did for ABC News on cluster bombs. 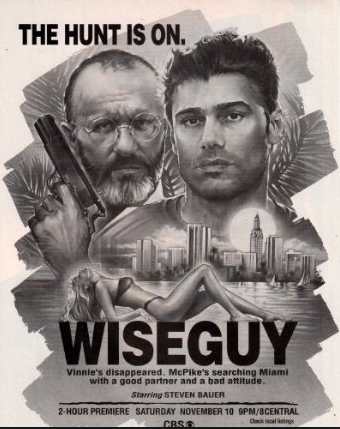 The Wiseguy episodes, which opened the fourth season of that iconic Stephen J. Cannell series, starred Steven Baur who replaced Ken Wahl in the lead role. Cannell, who died tragically years before his time, was arguably the most prolific writer-producer of dram in TV history. Ironically Bauer jump-started his career again after appearing opposite Banks and Brian Cranston as Don Eladio Vuente, boss of the Mexican Ciudad Juarez Cartel who was poisoned by Gustavo Fring, the New Mexico meth kingpin played by Giancarlo Esposito. In episodic TV back then we called it a “clip show,” in that Sonny Crockett (played by Don Johnson) gets shot in the Teaser and for the rest of the hour we intercut him in ICU with great scenes from the first four seasons. I wrote the teaser, which I’m very proud of and almost all of the “connective tissue” dialogue. The episode opens with the Phil Collins classic “In The Air Tonight” then moves into a drug bust gone bad, followed by a serious car chase and a shootout in a Miami Metro station. And that’s just in the first five minutes. 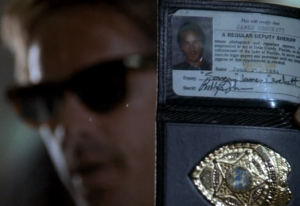 “Miami Vice” was a breakthrough series, created by Anthony Yerkovich, but fully realized by Michael Mann. It brought feature film production values to television and soon-to-be stars like Bruce Willis, Chris Rock, Ben Stiller, Liam Neeson, David Strathairn, Benecio del Toro, Stanley Tucci, Steve Buscemi, Helena Bonham Carter, Charles S. Dutton, Michael Chiklis, Joan Chen, Ron Perlman, Annette Bening and Wesley Snipes. Also, the series boasted an astonishing list of legendary character actors like Oliver Platt, Luis Guzman, Tony Sirico, Tony Plana, Pruitt Taylor Vince, Cary-Hiroyuki Tagawa, Miguel Ferrer, Joaquim de Almeida, Mark Linn-Baker, Lonette McKee, Chris Elliott, John Turturro, John Spencer, Phillip Baker Hall and James Hong. And then there was the “stunt casting” of performance legends like Phil Collins, Glenn Frey, James, Brown, Willie Nelson, Little Richard, Leonard Cohen, Issac Hayes and Frank Zappa. All of that the work of the great casting director Bonnie Timmerman, who also cast Crime Story for Michael Mann and most of his other feature film work. 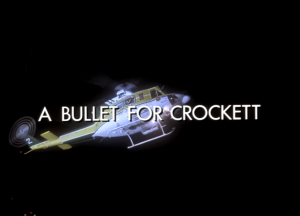 You should watch “A Bullet For Crockett” tonight with a Cuba Libré in your hand. If this doesn’t take you back to the 80′s nothing will. You can watch it with commercials at NBC.com. Thanks for all of the information here. It is all very intriguing. I missed out on so many of these shows in the eighties while I was putting myself through graduate school, married, and then became a new mother. I look forward to watching them now. Thank you, for your good work through the years, and the fun entertainment!